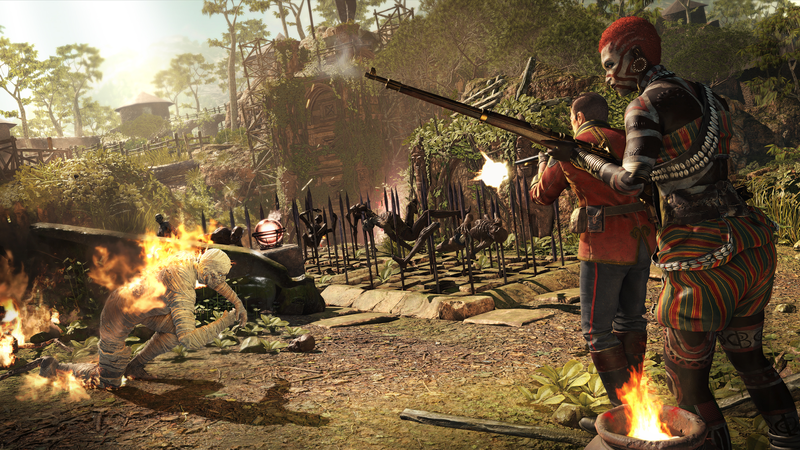 Rebellion Developments; the studio behind Strange Brigade have long been a soft spot for me. I still remember my first time like it was yesterday, it was dark, not the best looking thing I could afford but it was well within my budget, best of all it was explosively fun and entirely unforgettable. That first experience with Rebellion was the game Judge Dredd: Dredd vs Death and beside the Sly Stallone movie was my first real experience with The Law. Now anytime I see a game with that all too familiar red Rebellion logo I am instantly down to clown because one always wishes to relive their first time right? 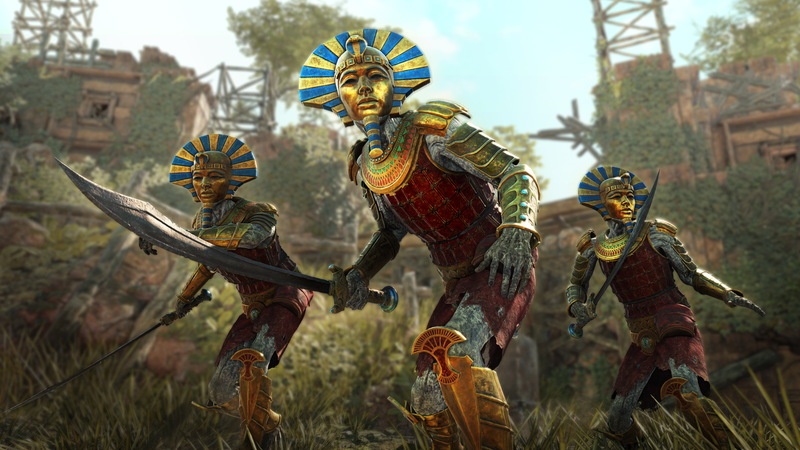 Rebellion’s latest offering is Strange Brigade a third person co-op shooter with a heavy emphasis on co-op. In the game you play as one of four British Secret Service Operatives, The Northern Redhead Gracie Braithwaite who likes her weapons to pack a punch, The Maasai Warrior Nalangu Rushida who is all about hitting as many times as she can, The Oxford Scholar Archimedes de Quincy who is the jack of all trades in weaponry and finally The Soldier of Fortune Frank Fairburne who plays at long range but always hits hard. 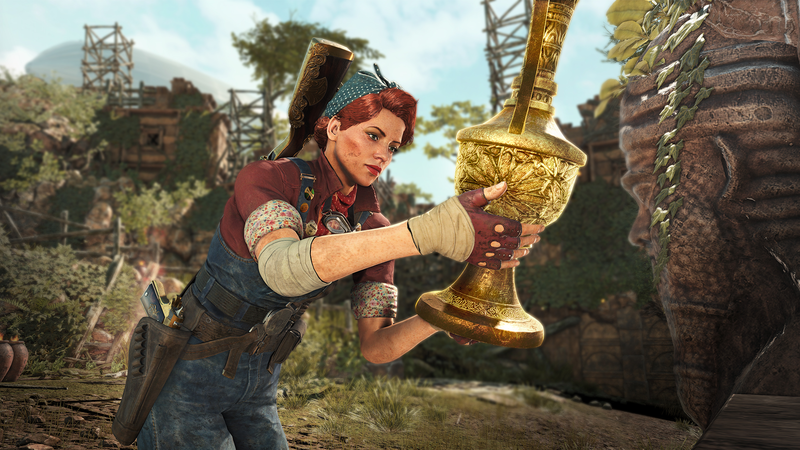 Strange Brigade keeps its gameplay moderately simple as less is sometimes more, after picking your character and whatever load out you want for them you are off to the races. Rebellion have an older school approach to the game often leaving me feeling like I was playing the Egypt level of Timesplitters. The entire game is presented as an 1930’s pulp adventure, voice overs are over the top, jokes are cheesy, cutscenes are in black and white even the ones revealing things mid level and it all works to create a game that feels original in that regard. Remember when I said its gameplay is less is more? Well there isn’t a huge amount of variety in the game, you move through killing any number of mythological creatures while solving puzzle and collecting treasure. More often than not the game boils down to moving from one arena to the next either solving a puzzle to leave or killing enough enemies to satisfy the soul gate that blocks your path, sometimes both. One really cool thing that helps immensely with the hordes (often 50+) of enemies is the amount of traps you can set off to aid in their destruction. The traps consist of things like giant pendulum blades, spikes from the ground, blow darts, giant saw blades, boulders and the good old fashioned fire to kill everything with. Sometimes less can be more unless its with treasure in which case more is more and this game will give you it in spades. Each level last for roughly an hour and treasure can be found just about everywhere and the collectibles are little crazy. Each level has a bunch of relics which are generally found by solving puzzles, though some levels you will have to hunt down a monster trying to sneak off with one, and when a set is completed you are given weapon upgrades. There is also a bunch of different cats you need to find each level has 6 blue cat statues that will meow when you get close to them, another 4 cat jars which are more sneakily hidden and one golden cat which can only be obtained by shooting the 6 cat statues. There is also countless letters, journals, gold, weapon upgrades in the form of chests and limited use weapons to help you out in a pinch. Is this game brilliant? No its far from being the next Left 4 Dead but it isn’t trying to be. 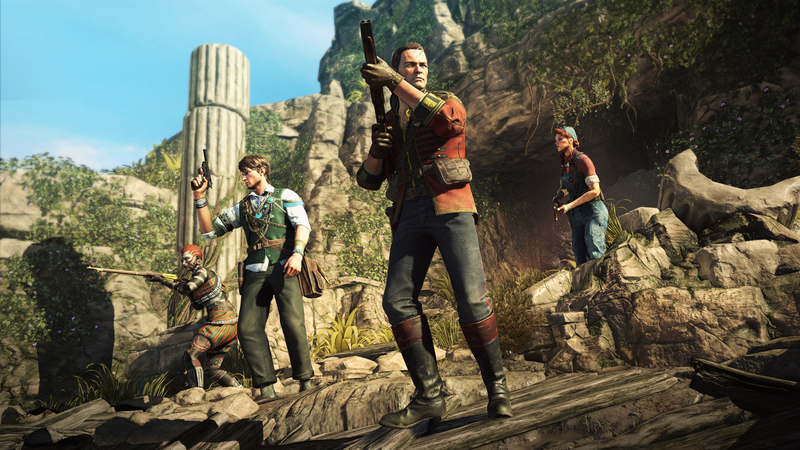 Strange Brigade is instead choosing to bring uniqueness to the table giving a lovely rich world, brilliant throwback pulpy atmosphere and a more couch level of multiplayer. 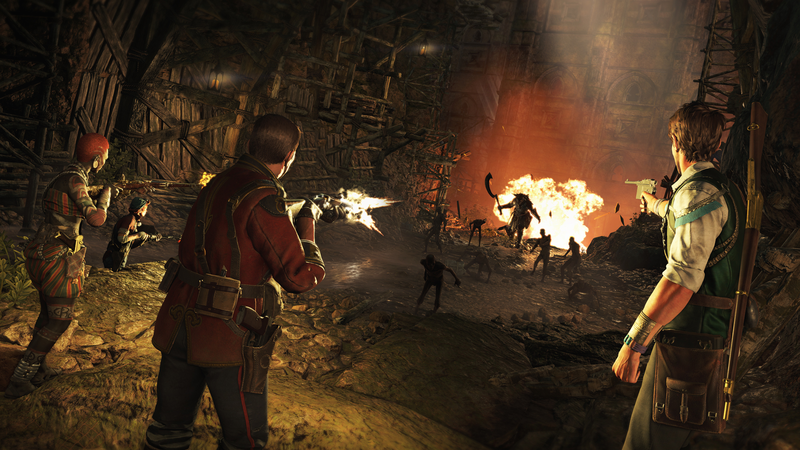 Left 4 Dead wants you to panic and fight against the odds while Strange Brigade wants you to grab some weaponry, enhance so it can freeze whatever it shoots and do it with some buddies on the couch. If you have some real life friends you can convince to come over with some beer and pizza for a couple of hours to kill you that want filled with a few laughs then this game is aimed at you. It's plain ole dumb fun. 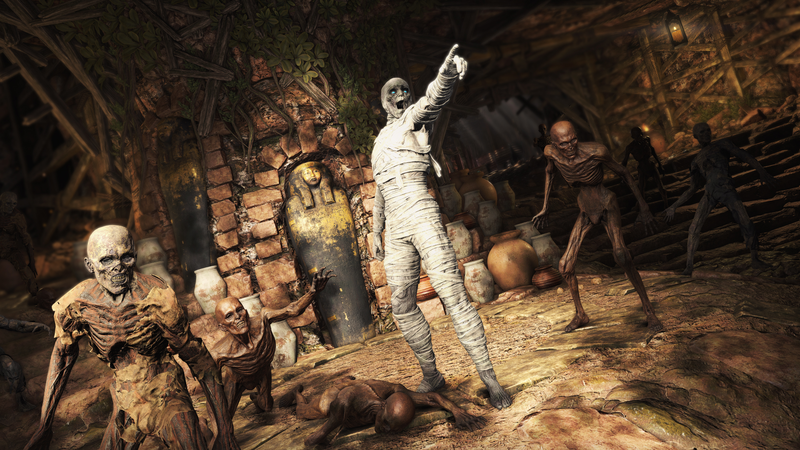 Zombie was provided with a review copy of Strange Brigade. Looks like fun, gives me the Temple Of Doom Indiana Jones vibes. Would you wait for a specific sale price point or pay full price? I've already seen it marked down at places so I wouldn't pay full price. It is dumb fun, possibly too dumb for some people so I would wait. The biggest draw back is just how long some of those levels feel, some by 30 minutes in I'm ready for the boss, others about 45 minutes in and knowing I still have 1/2-1/4 of an hour to go ya know. And that was without trying to find all the secrets so you could easily sink more time in. Would be cool if it was cheap enough/free for a couple of friends to pick up for some fun. Are you likely to play it much on your own? Yeah it's fun single player and a fine thing to play while waiting for something to install or update or when you just feel the need to kill some zombies. But it is designed for 4 people playing so when you are playing single player you get all the enemies as you would for 4 players which can be daunting as the guns have very little ammo meaning you can get left with an infinite ammo handgun that does next to no damage running around but you have the traps to even that often taking out a huge amount at once. Do you know if it can be played in local co-op? Do you know if it can be playing local co-op? As of Aug 18, it seems not. @iLythiumyeah sadly not at the moment, devs haven't ruled it out but probably wont as they didn't want to forsake graphics enemy numbers etc that will probably need to be dialed down to do it. Which is a shame cause as I said it demands local co-op. I mean without needing to set up a rig for each player. Yeah I didn't think it did but the bit about inviting people over confused me. It definitely seems like it needs it!